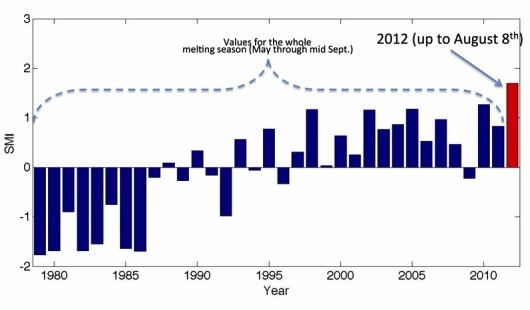 The cumulative melting index is what scientists use to quantify both the extent and duration of melting over the Greenland ice sheet and is typically measured at the end of every melt season, about mid-September. Though the final tally for this year’s cumulative melting index isn’t due for another four weeks, it has already broken the previous record set at the end of the melt season in 2010. Researchers reported this week that as of August 8th the ice shelf atop Greenland has melted more than at any time since such measurements began 30 years ago. This most recent report of ice melt in Greenland follows on the startling news last month that 97 percent of Greenland ice surface had melted to some degree in as little as four days. Some of that ice refroze within a few days “changing the physical properties of the snowpack but very likely not contributing to the meltwater that run off from the ice and can potentially contribute to sea level rise,” said Marco Tedesco, assistant professor of Earth and atmospheric sciences the City College of New York and author of report. The recent data on overall melt as measured by the cumulative melting index can impact sea level rise from meltwater flowing directly into the ocean or through “basal lubrication” where meltwater flows into deep crevasses, lubricating glaciers and precipitating the flow of ice into the sea. 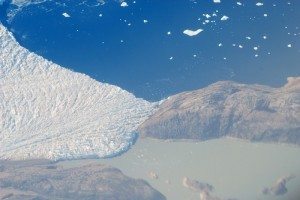 “Over the past few years about half of Greenland’s contribution to sea level rise has come from meltwater, and half from ice going directly into the sea,” Tedesco said. A number of factors play into the accelerated surface melt over the past decade, he explained, with higher air temperatures in the Arctic principal among them. The highlands of Greenland, which normally experience melting for only a few days each season, if at all, now endurs melt conditions for weeks. When the snow melts and refreezes it becomes darker, when the snow disappears entirely leaving bare ice exposed, the surface is darker still. All this melting/refreezing or melting entirely alters the albedo effect, which absorbs more of the sun’s energy. A study released in June confirms that Greenland’s albedo is higher this season the normal. The accelerating ice loss shows Greenland in a state of change predicted by climate models, but coming at a quickened pace models have not foreseen.